The Smoke: The Brands That Will Die. Twelve brands that will die: the beauty in transmigration, dissolution and carnage. There’s a metaphor that where there is smoke, there will be fire — and finally, in the fire, the smoke clears, and who will be there; what will be left? 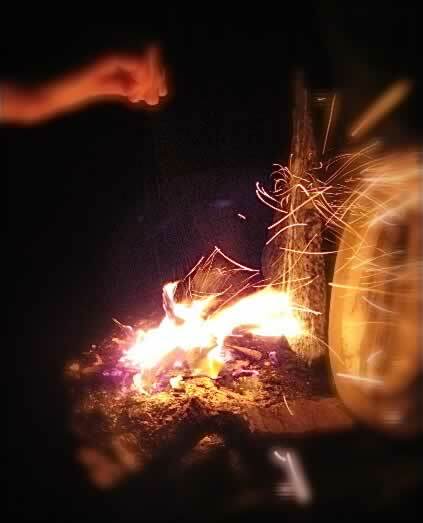 Fire is a kind of transmigration — from one structure, one form, to another; there is something that happens in fire-making; with heat, the molecules accelerate, combine, collide — and the speed that they bring, it’s so fast that literally, they evolve to a new form. And, alchemically, they are translated to a new form — perhaps even to evanescence. They vaporize. Same with brands. Transitions accelerate and finally, the structuring that they might’ve had in the past simply cannot be sustained. And who knows what happens next — there are surely formats of evaluation — those that examine the components of living, and dying, brands. Pointed out by a friend of mine, here’s one grouping of positions. And right now, I don’t agree with all of them — but there is likely truth in the revealing prophecy. Then again, the step by step moves of the market challenges that we sense, that we all feel — who, too, among us, will survive the steep tasks ahead? It’s surely a question that I ask myself. After 35 years, will I last? “1. Avis/Budget (CAR) operates two car rental businesses. The primary competition for the company is Hertz (HTZ). Both firms are facing significant problems paying down their debt. Barclays Capital analyst Brian A. Johnson said the companies are “facing an almost perfect storm, with increasing pressure on both revenues and costs, coupled with very large risks on the liquidity and operational side.” There is real risk that Avis may violate its credit facility covenants. As the travel industry continues to falter, problems at Avis/Budget are going to get worse. The company has said that it plans to operate both brands. Their financial statements indicate that will become increasingly difficult. Avis is the larger operation with 5,100 locations to Budget’s 2,750, according to the company’s 10-K. Avis/Budget lost money each of the last three years and in 2008 lost $1.1 billion on revenue of $6 billion. As sales drop through 2009, Avis/Budget will find it impossible to support the costs of maintaining two brands. The Budget brand will have to be eliminated. CAR trades for $1 down from a 52-week high of $18. 2. Borders (BGP) has struggled for several years as the No.2 operator of book store behind Barnes & Noble. When Border’s released its last set of earnings it said it would cut the number of Waldendbooks stores from about 300 to 50 or 60. With Border’s losses, that won’t be enough. The pressure from online book operations led by Amazon (AMZN) and new e-book readers is overwhelming Borders. In the fourth quarter of last year, sales at Border’s branded stores dropped 15.3%. For the full year 2008, Borders lost $157 million on revenue of $2.8 billion. Borders recently extended its $42.5 million senior secured term loan with Pershing Square Capital Management, moving the due date to April 1, 2010. That may be the day that Borders goes away. Border’s shares trade at $1.47, down from a 52-week high of $8.02. 3. Crocs (CROX) sold the fastest growing footwear in America at one point. In late 2007, the company’s shares traded at more than $72. Now they change hands at well below $2. At the end of March, Crocs got a six-month extension of a critical credit facility. According to Reuters, “Crocs Inc averted a cash crunch by winning an 11th-hour credit facility extension with a California bank, but analysts say the jury is still out on whether the struggling brand can turn around.” Two weeks before the credit extension, the company’s auditors gave the firm a “going concern” letter, an indication that there would be reasonable chance that Crocs would make it another year. In the fourth quarter of 2008, Crocs lost $43 million after making $55 million in the same period the year before. Revenue fell from $225 million in the last quarter of 2007 to $126 million. Crocs won’t make it through the year. 4. Saturn was created by former GM (GM) CEO Roger Smith to be the company’s platform for manufacturing and marketing innovation. GM, now faced with bankruptcy, will almost certainly close its poorly performing brands. In the first quarter, Saturn sales dropped 59% to 19,843. GM can’t afford to support a brand with poor sales that are falling at such a rapid pace. 5. Esquire Magazine is published by Hearst which is having substantial problems in both its newspaper and magazine divisions. Hearst recently threatened to close The San Francisco Chronicle after losing tens of millions of dollars during the last several years. It kept the paper open after the staff agreed to huge cuts. At about the same time, Hearst closed its paper in Seattle. The collapse in print advertising has pushed revenue at most of Hearst’s large magazines down by double digits after a bad year in 2008. Flagship titles such as Good Housekeeping and Cosmopolitan have been hit especially hard. Hearst is going to have to cut some of its anemic magazine titles. Esquire is among the weakest of the major men’s magazines on the basis of advertising page performance. Through April, ad pages at the magazine dropped 27% to 206. Men’s magazines are one of the most crowded categories in the industry. Esquire is up against GQ, Details, Men’s Journal, Maxim, and a number of men’s fitness and health publications. The men’s magazines which are performing the most poorly will not last long. Big publishers such as Hearst and Conde Nast have already proven that they will cut what they have to in a brutal environment. 6. Gap (GAP) Old Navy and Banana Republic. Gap is a three-brand company living in a two-brand body. In March, same-store sales for the Gap North America flagship brand were off 14% following a 14% drop in the same month in 2008. Sales at Old Navy were flat for the same month but dropped 27% in March 2008. Sales at Banana Republic were off 16% this year and 8% last year. Gap announced that year-to-date net sales were $2.08 billion for the nine weeks that ended April 4, 2009, a decrease of 9% compared with net sales of $2.28 billion for the nine weeks that ended April 5, 2008. Old Navy has more stores than Banana Republic, 1,067 compared to 573. In the fourth quarter of last year, Gap had less than a 6% operating margin on $4.1 billion in revenue. In other words, if same-store sales at the company continue to drop 15% month after month, Gap is going to run into problems. Old Navy is still the weakest brand of the lot. Gap will have to close it down. 7. Architectural Digest Magazine has lost 47% of its ad pages this year. The magazine is owned by Conde Nast which is controlled by the Newhouse family. Newhouse is having significant financial problems with both its newspaper operations, which used to be very profitable, and its magazine group. Architectural Digest is operating in an environment where high-end home sales and expensive redecorating have been driven out of the market. It is also up against a number of other home and shelter magazines. Publications which are losing nearly half of their ad pages are almost certainly not going to make it for another year no matter what subjects they cover. Conde Nast has already closed or cut back several of its magazines. 8. The Chrysler brand of Chrysler LLC faces a problem similar to the one that GM faces with its weakest brands. As it moves closer to bankruptcy, the automaker knows that it cannot support product design, manufacturing, and marketing for all of its brands. An analysis of Chrysler LLC sales by division shows that the Chrysler brand has substantially worse sales than Dodge or Jeep. Through the first quarter, Chrysler sales dropped 61% to 45,706. The only nameplate within the brand that sold more than 20,000 vehicles was the Town & Country which could almost certainly be moved to the Dodge division. Dodge and Jeep both sold substantially more cars than the Chrysler brand even thought their sales were down 40%. When the company is restructuring Chrysler will be gone. 9. Eddie Bauer (EBHI) stock trades at $.38 now. Just last September it changed hands at more than $8. The company has said that it may violate debt covenants this year. According to the AP, the company also has severe competitive problems. “The retailer is facing an uphill battle because its merchandise doesn’t stand out among competitors such as outdoor retailer Recreational Equipment Inc., according to Janet Hoffman, managing partner of the global retail practice of Accenture.” In the fourth quarter of 2008, Bauer lost $128 million on revenue of $369 million. The company’s current S&P rating is about as low as it could be—CCC-. Eddie Bauer could be out of business by mid-year. 10. Palm (PALM) has been at death’s door for some time. It prospects have improved recently and the company has one last chance to become viable when it launches its new “Pre” product. Recent research shows that almost no one who owns an Apple (AAPL) iPhone or RIM (RIMM) Blackberry will switch to the new smartphone, so Palm will have to essentially expand the market to get share for its new device during a recession. The “Pre” will also be sold exclusively though Sprint (S), the No.3 cellular carrier in the US which has been losing subscribers consistently for more than two years. The launch of the “Pre” is a disaster in the making. Palm’s results for the quarter that ended on February 27th were awful, failing to meet Wall St’s modest expectations. Palm sold only 482,000 handsets for the period, down 42% from the same quarter the year before. Revenue dropped from $312 million to $91 million, and Palm lost $95 million. Palm brought in just over $100 million with the help of its largest shareholder, Elevation Partners, in a recent financing. The bottom line is that Palm has no chance of getting an even modest part of the smartphone market in a severe economic downturn since it competes with two of the premier technology companies in the world—Apple and RIM. Palm won’t be in business in a year. 11. AIG (AIG) may be the only large company in America that both the management and federal government want torn apart. If AIG succeeds in selling most of its divisions it will be able to repay more than $100 billion in government loans and investments. The figure may be closer to $150 billion depending on how the federal money is accounted for. Uncle Sam also owns 80% of AIG’s shares. There are two reasons that the AIG brand, once the premier insurance brand in the world, will disappear. The first is that most of the companies owned by AIG do not bear its name. AIG owns ten general insurance companies with names such as New Hampshire Insurance Company and The Hartford Steam Boiler Inspection and Insurance Company. Several of AIG’s life insurance companies do not have AIG in their titles. AIG’s most valuable financial services company is probably the aircraft leasing operation, International Lease Finance Corporation. AIG is now a “toxic” brand. Its operating groups will do their best to distance themselves from the company even while they are owned by AIG. Once they become independent of part of other companies, these operations will end whatever attachment they have had with AIG even if it means changing their names. 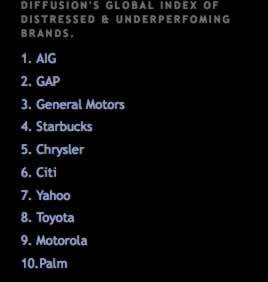 AIG may be the one large brand in America which almost everyone would like to see disappear. There are a grouping of puzzles here — but the one that is most common, to my take, is forgetfulness. I’d offer that brands — or any enterprise, for that matter — need to realize their resonance at the heart of memory; memorialization is at the center of a relationship; if you can’t remember the “name”, the connection, the relevance and resonance, then where is the link? It’s no where. Each of the brands that are noted above either forgot who they were, forgot what story they were telling, or simply forgot the thread of their relationships — the bridge between the audience and the marketing of the brand, story, enterprise. Oh — and is this really the finalized list? No, lists — there are plenty of others, like this one. Sad when that happens. But, it does. To all of us, at various points in time…Good to recall, literally, that connection to the mimetic link that we’ve got with each other.